Rolled up in the Far Hills countryside, the USGA Museum is home to the world's premier collection of golf artifacts and memorabilia. The USGA, the governing body for the game in the United States and Mexico, has since 1972 made its home on a magnificent property that was for many years one of the premier estates of Somerset County. 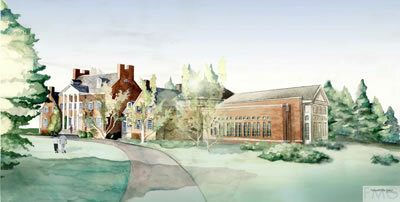 The association completed a major renovation and expansion project that filled the better part of three years. On June 3, 2008, the USGA opened of its new facility - the Arnold Palmer Center for Golf History - and the nation's oldest sports museum has become New Jersey's newest nugget. The museum grounds at the USGA headquarters in Far Hills. Founded in January 1936, about a year before the National Baseball Hall of Fame was established in Cooperstown, N.Y., the USGA Museum was the first museum in the country dedicated solely to sports. In the 72 years since the creation of the museum, the collections have grown to comprise more than 42,000 artifacts, a library of more than 20,000 volumes, more than half a million photographic images, and several thousands hours of historic film, video, and audio recordings. Together, the museum's collections present a comprehensive history of the game's development in the United States over the course of nearly 250 years. They are also the finest collection of golf memorabilia in the world. 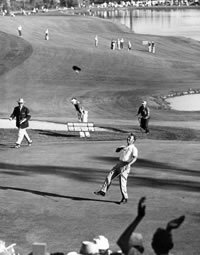 Arnold Palmer celebrates at the 1960 US Open. 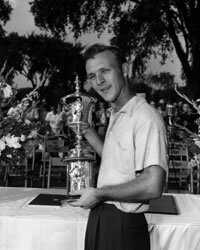 Below: Palmer at the 1954 US Amateur. Photos courtesy USGA. But the exhibits in the new USGA Museum offer much more than vintage golf clubs and golf balls artfully displayed behind glass. The museum staff dug deep into the vast and extensive archives at its disposal. As a result, the new exhibits feature hundreds of historic photographs, as well as numerous multi-media, audio-visual presentations. Visitors also have an opportunity to learn about the game through entertaining interactive displays located through the exhibition galleries. When they finish their visit inside the museum's walls, visitors can experience a bit of the game's past on the museum's new putting course. Here, visitors will select from a variety of replica golf balls and putters representing various eras in the game's history, and play with them on a newly-constructed, 15,000-square-foot putting green. Armed with the same equipment and technology that the great champions of the past may have used, players are able to understand a bit of the game as it was played in the late 19th or early 20th century. The focal point of the USGA Museum - in many ways its heart and soul - is the new Hall of Champions, a magnificent space that is the architectural highlight of the Palmer Center. The names of every USGA national champion are inscribed on bronze panels that encircle the walls of the clerestory-lit, oval rotunda. Displayed in three artifact cases that stand at the center of the room are the 13 original USGA national championship trophies, including, most prominently, the United States Open Championship Trophy, representing the game's most prestigious title. Although the USGA Museum is not a hall of fame in the traditional sense, it has created this distinctive way to recognize the more than 500 individuals who have been crowned as our nation's most talented golfers. Another space making its debut is a gallery celebrating the life and career of Arnold Palmer, the first American golfer who truly became a national icon. The Palmer Room showcases more than 100 artifacts from the personal collection of Arnold Palmer, a three-time USGA national champion. The exhibits in the room explore Palmer's career on the course, as well as the more personal aspects of his life, including his childhood years in Latrobe, Pa., and his love for flying. At the center of the Palmer Room is a remarkable portrait of "The King" that was created by James David Chase, a college professor and artist from California. Over the course of 14 years, Chase meticulously laid out thousands of quotes comprising more than 22,000 words to create an image of Palmer that must been seen to be truly appreciated. The portrait is a testament to the special relationship that has existed for decades between Arnold and the hundreds of thousands of fans who call themselves "Arnie's Army." An interactive kiosk enables visitors to explore the portrait in great detail, allowing them to zoom in and out of a digitized version of the image, as well as listen to interviews with the artist describing how the work was created. 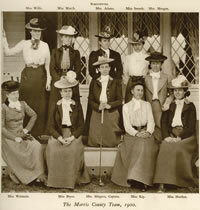 Among the artifacts on display in the new Arnold Palmer Center for Golf History is this photograph of some early members of the Morris County Golf Club in Convent Station, the first golf club in the United States founded exclusively for women. The exhibits are not just about the great players of the past, however, for the museum's staff is equally committed to collecting history as it happens today. Artifacts from the most popular players of today - Tiger Woods and Annika Sorenstam, to name just two - are also featured within the exhibitions. To support this effort, the museum has stepped up its efforts to collect artifacts quite literally from the hands of recent national champions. Argentina's Angel Cabrera, the winner of the last year U.S. Open at Oakmont Country Club outside Pittsburgh, donated the driver that he used to hit an astonishing 390-yard drive during the final round. Ben Crenshaw, for many years one of the most popular players on the PGA Tour and now a standout on the Champions Tour, presented the hat that he wore in the final round of last year's U.S. Senior Open. And Hawaii's teenage sensation Michelle Wie offered the museum the golf ball she used in 2006 when she attempted to become the first female to qualify to play in the U.S. Open. The USGA museum has long been a Mecca for those who are passionate about the game. From the early 1990s until the museum closed to prepare for construction in 2005, some 20,000 avid golfers made the pilgrimage to Far Hills each year to visit the museum.But the new USGA Museum is certain to provide an experience that is fun and educational for everyone, even for visitors who may never before have had the opportunity to hold a golf club in their hands. Whether you are an avid golfer, a scholar of the game's history, a casual sports fan, or simply someone interested in the history of American culture, the USGA Museum aims to provide a unique and memorable experience. Museum Hours: Tuesday to Sunday 10 a.m. – 5 p.m. Closed Monday and major holidays. 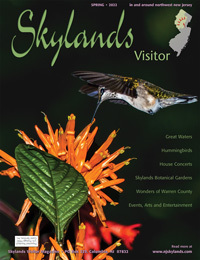 Admission: Adults – $7, USGA Members – $5, Group Rate (10 and over) – $5, Children (13-17 years) – $3.50, Children under 12 – Free. You can expect to spend 2 hours when visiting the museum. For more information check the USGA website or call 908/234-2300.